Crimson Cup is proud to sponsor The Coffee Innovation College at NARSA in La Merced! It recently became one of the first SCA Premier Training Campuses in Peru to be certified under the latest standards! “Our goal is to arm NARSA co-op members with the skills and tools they need to craft exceptional high-point coffees,” said Brandon Bir, director of sustainability and education for Crimson Cup. 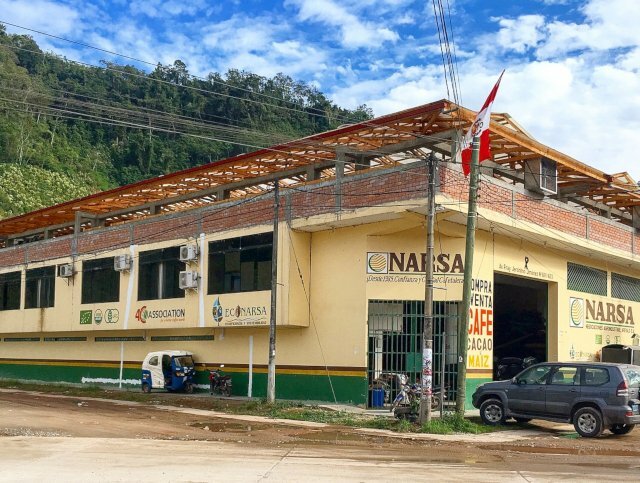 Crimson Cup has been working with NARSA (NEGOCIACIONES AGROINDUSTRIAL AREVALO S. A. ), a cooperative in Junín region, for the past five years. Founded by Don Julio Abel Arevalo Tello in 1988, NARSA helps small coffee and cacao farmers in Peru’s Central Highlands and Amazon regions to gain market access throughout Peru and beyond. Brandon, who is also a licensed Q Grader and SCA Lab Inspector, worked with NARSA and its affiliated COOPERU organization for two years to develop the Coffee Innovation College. Crimson Cup consulted on building and equipping the lab to SCA standards and contributed professional quality coffee grinders. Crimson Cup has sourced a number of coffees over the past five years through NARSA, including Oxapampa Peru Gesha, which won a silver medal at the 2018 Golden Bean North America Awards. Farmer Hector Portocarrero grows the coffee at elevations of 1,750 meters. This cherry-dried coffee has tasting notes of tropical fruit, watermelon and pomegranate. Brandon plans to teach a sensory evaluation class later in 2019 for coffee professionals in Peru who want to learn more about coffee tasting and Q grading. Stay tuned for updates! Cheers to National Cold Brew Day! Columbus, Ohio coffee roaster Crimson Cup Coffee & Tea is Roast magazine’s 2016 Macro Roaster of the Year. Since 1991, Crimson Cup has roasted sustainably sourced specialty and craft coffee in small batches. The company also teaches entrepreneurs to run a successful coffee shop through its coffee franchise alternative program, which includes a coffee shop business plan. Crimson Cup coffee is available through a community of more than 350 independent coffee shops, grocers, college and universities, restaurants and food service operations, as well as in the company’s own coffee shops in Columbus.